Archangelos (Greek Αρχάγγελος)¹, seat of the municipality with the same name, is located on the eastern part of the island of Rhodes, at 28 km from the town center, on the main road that connects the town of Rhodes with Lindos. 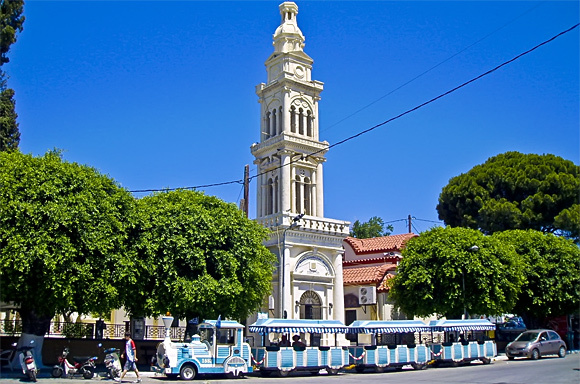 It is a charming and lively village, with narrow streets and colorful traditional houses full of mediterranean architectural clues with small yards adorned with flowers, some of which were built several centuries ago. Excavations in the broader Archangelos area brought into light the existence of many small settlements dating back to the Hellenistic times. Most of them are concentrated on the coastal area while others are more inland. After the 7th century AD most of the settlements near the coast were abandoned due to the frequent pirate invasions and their inhabitants moved to more secure areas. Over the time the various settlements were merged, forming the village of Archangelos. 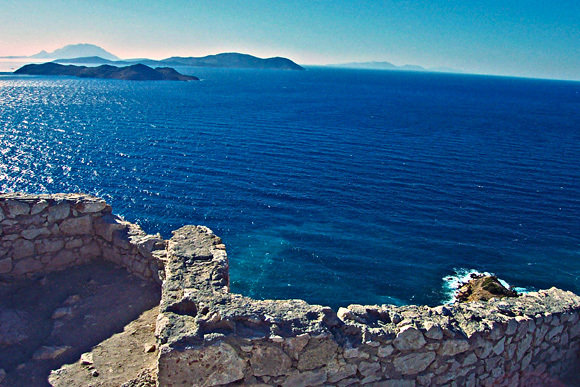 In later times, between the years 1454 – 1476, the Knights of Rhodes – also known as the Knights of Saint John or Hospitallers – that were defending the island from the Ottoman invasions, built a fortress on top of one of the Archangelos’ nearby hills, incorporating parts preexisted Byzantine castle, to offer protection to the village inhabitants. Today some ruins remain with a 7 m tall fortification wall and the small chapel of Aghios Ioannis. In the villager center the church of the Archangel Michael, patron of the village, and its old campanile built in 1845, dominates the view. 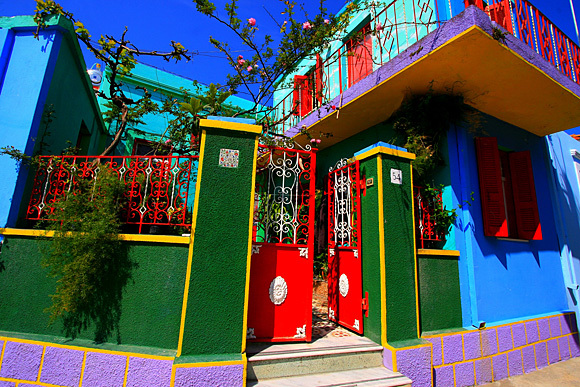 The houses are full of vibrant, apparently contrasting, colors creating an intriguing combination that never fails to impress the visitors. A walk in its narrow streets will reveal a very active community that like to keep alive the Greek traditions, beliefs and celebrations whose roots are embedded in the depth of centuries. Of particular interest is the Carnival of Archangelos, a three day long celebration that involves traditional customs and events like the mouzoma, where participants paint their faces in black using ash. There are several interesting attractions around Archangelos like the nice beach resort of Stegna (2km), the marvelous sandy beach of Tsambika (3km), and the peaceful fishermen pamphlet of Haraki (7km). A cave, located 3 km away on the peak of the hill Koumelou, is of considerable archaeological and speleological interest. Recent excavations have brought to light vases and other artifacts dating from the Neolithic and Mycenaean periods, thus attesting to the very ancient origins of human habitation in the area. ¹ A common problem when dealing with Greek names is how to render them using latin characters. The correct way would be by using transliteration, a method that converts the words written in one writing system into another writing system. Using this method the Greek word Κάμειρος would be rendered as Kàmeiros or Kameiros. We think that most of the times this type of conversion will create problems with the actual pronunciation. So instead in this site we try to use the phonetic Greeklish method because we feel it’s simpler and when pronounced is better to understand by the Greeks. Next PostAre you exposing yourself to enough sunshine for vitamin D?